HEMPSTEAD, Texas – The Waller County Fair and Rodeo has long been a destination point for folks in southeastern Texas because of the overall entertainment packed into 10 days. Fair and rodeo organizers have stepped it up for 2013, including a major move on opening weekend. The opening Saturday night of the fair will feature an incredible lineup that includes Bull Mania and the Stoney LaRue concert, all happening at the Waller County Fairgrounds in Hempstead. Texas Music artist Stoney LaRue will be part of an action-packed Waller County Fair and Rodeo on its opening Saturday, Sept. 28. It will also include a 30-man bull riding, Bull Mania. The evening is kick-started at 6:30 p.m. with mutton busting, a fan-favorite that features young daredevils riding sheep. It will be followed by calf riding, a calf scramble and Bull Mania, a stand-alone bull riding event that is part of the Triple Crown Championship Bull Riding Series. The LaRue concert closes out a full day of activity. “We’ve got our Kid Zone, which begins at 12 noon that day and runs all the way until 5 p.m.,” Sciba said, noting the Kid Zone will feature moon walks, a petting zoo, pony rides, face painting, a pet show at 2 p.m., a miniature cattle show at 3 p.m., and the Texas “Gator Country,” which will feature educational sessions, photographs with snakes, alligators and all other types of reptiles from 1-4 p.m.
“The great thing about that day, like almost every day of our fair, is that you can come early and enjoy a full day with the entire family,” Sciba said. Bull Mania will feature 30 outstanding bull riders competing. The top six scores from the first round qualify for the championship round. “We have something going on in our rodeo arena every day of the fair, and I can’t think of a better way to begin this thing than to have Bull Mania,” Sciba said. “In this part of the country, we love our rodeo. But the cool thing about Bull Mania is that people who don’t know much about rodeo still love to watch bull riding. So will the LaRue concert, which will being about 11:30 on the fair’s main stage. His single “Travelin’ Kind” surged to No. 1 on the Texas Music Chart this past February. LaRue released his first album a decade ago; since then, he has been one of the elite acts on the Red Dirt scene. 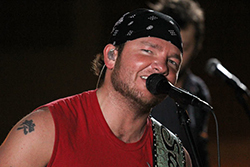 His current album, “Velvet,” was released two years ago and marked the first time in six years he had released a studio album – “The Red Dirt Album” was released in 2005, then LaRue followed with “Live at Billy Bobs” in 2007.